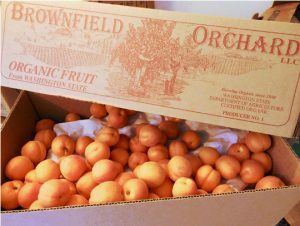 What this means for you as Co-op customers, is that we will likely see less of Brownfield’s delicious fruit than we normally do, and that the fruit we receive may have some damage. Mike has also let us know that he expects to have many cases of fruit available for canning, so if you are interested in purchasing a case of slightly damaged fruit, please let a produce worker know and we can get you information on pricing and availability. It’s really sad how such a short and unusual weather event can cause such a horrible amount of damage, and it should remind us all of the risk that farmers take every day to bring us the fresh, high-quality, healthy, organic produce. I wrote about this last month, but I want to reiterate that as climate change continues to happen, we will likely see more weather events like these, more pest infestations, and a harder time controlling plant diseases. So take a moment to appreciate your produce, even when it’s not cosmetically perfect.